Philadelphia songwriter and guitarist Kurt Vile is photographed in Penn Treaty Park September 20, 2018. He has his first new record in three years, Bottle It In, coming out in October. In "Loading Zones," the first video from Kurt Vile's new album, Bottle It In, Philadelphia's leading indie rock star drives a beat-up Chrysler convertible around his hometown, evading a pair of overzealous Parking Authority agents frustrated by the mischievous guitarist's clever errand-running strategy. "I mean, they're everywhere," the 38-year-old songwriter says of the safe-for-20-minutes parking spaces scattered around the city. "A.K.A. was the main one," he says, wistfully referring to a cherished spot outside the no-longer-extant Old City record store. "You ran in, picked up your compact discs. Get in, get out." But while the "Loading Zones" video — directed by Drew Saracco and featuring Goodfellas actor Kevin Corrigan and Pissed Jeans singer Matt Korvette as stymied meter men — maps out a strategy for navigating the city, it also works as a broader metaphor. "It's also a way of life, a mentality," says Vile, who lives in Mount Airy with his wife, Suzanne, and daughters Awilda, 8, and Delphine, 6. "Getting by on the backstreets. Slipping and slithering and snaking around. Putting one over on the man. It's very Sopranos, minus the murder." He laughs. "Go as far as you can, just don't murder anybody!" Slipping and slithering and snaking are appropriate words to describe Vile's songs, which take their sweet time getting where they want to go. On Bottle It In (Matador *** ½), hypnotic wanderers like "Bassackwards" — one of three songs in the 10-minute range on the album — savor the journey as they circle back on themselves, casting a shape-shifting spell. On Dec. 29, the local hero will play his biggest-ever Philly show when he and his band the Violators — with the Feelies and Snail Mail opening — will be among the first to headline the Met Philadelphia, the refurbished 3,500-capacity opera house on North Broad Street that Bob Dylan is set to christen on Dec. 3. Vile sat for an hour-long chat on a recent afternoon in Penn Treaty Park in Fishtown, not far from where a mural celebrates his 2013 album Wakin on a Pretty Daze. A conversation with Kurt Vile is little like listening to a Kurt Vile song — lots of ground is covered as his mind jumps from one subject to another. Philadelphia songwriter and guitarist Kurt Vile. Bottle It In is the prolific Vile's eighth — and best — album since the self-confident songwriter called his debut Constant Hitmaker in 2008. Recorded over two years, Bottle It In gathers 12 originals plus a cover of country singer Charlie Rich's 1977 hit "Rollin' with the Flow." That's "the most AM Gold song I've ever recorded," Vile says of the song whose title is in sync with the easy-going image that masks his serious work ethic. In addition to the Violators, who are so road-tested and tight as to be "as close to Crazy Horse as anything I've ever had," the album features lots of guests, including harpist Mary Lattimore, drummer Stella Mozgawa, singers Holly Laessig and Jess Wolfe (of Lucius) and alt-rock icon Kim Gordon of Sonic Youth. Bottle is Vile's first solo album since 2015's b'lieve i'm goin down, though last year he put out Lotta Sea Lice, a collaboration with his Australian buddy Courtney Barnett, followed by a tour that played the Tower Theater in Upper Darby in November. That sold-out show happened down the road from where Vile grew up in Lansdowne, Delaware County, the oldest boy in a family of 10 children whose first instrument was a banjo given to him by his father, Charlie, when he was 14. In a cherished moment in April, Vile opened for John Prine at the Merriam Theater. Prine, whom Vile calls "such a hero" and "the greatest living American songwriter" brought him on stage to sing his father's favorite song, "Paradise," dedicating it to Charlie, who was in the audience. When not on the road, Vile is the chosen Philly guest of discerning touring acts from Prine to Yo La Tengo to African blues band Tinariwen. This month, he's showing up in prestige taste-making platforms like Marc Maron's WTF Podcast, where he'll be on a future episode, and Pitchfork, which produced a full-length video of Vile and the Violators rehearsing Bottle It In. This year, he made an appearance on the final season of Portlandia, a show he lobbied Fred Armisen to be on after binge-watching it with his wife. Vile's music appeals to classic and indie rock fans because of how it was shaped. As a teenager in the 1990s, he listened to his father's Johnny Cash and Anthology of American Folk Music records, and he also tuned into Smashing Pumpkins, Sonic Youth, and Pavement (who recorded for Matador Records, now Vile's home) on Philadelphia alt-rock radio station WDRE. These days, Vile is deep into classic country, spurred by reading George Jones' memoir I've Lived to Tell It All and Nick Tosches' Country: The Twisted Roots of Rock and Roll. "They just all make rock and rollers look like total posers. Because comparatively, they are. All those guys could just play the s- out of everything, and they lived even harder. S- kickers, you know?" Besides Bottle It In, Vile has more recordings in the can, including an album's worth of rock songs, and a separate project he's been working on in Nashville with Prine associate David Ferguson. The Zen quality in Vile's music that finds him puzzling over the riddles of the universe was distilled to its pop essence in "Pretty Pimpin," his irresistibly catchy 2015 lead track from b'lieve i'm goin down. Country star Keith Urban's included it on a 'Five Songs I Wished I've Written' list for Rolling Stone. "I don't know how he wrote it, but it sounds like pure stream of consciousness," Urban said, naming it alongside Waylon Jennings, David Bowie, Lucinda Williams, and Ed Sheeran tunes. But, seriously, he was flattered, though he first had to be told who Urban was. "But I'm in outer space like that," he says, apologetically. "Now I think he's awesome." 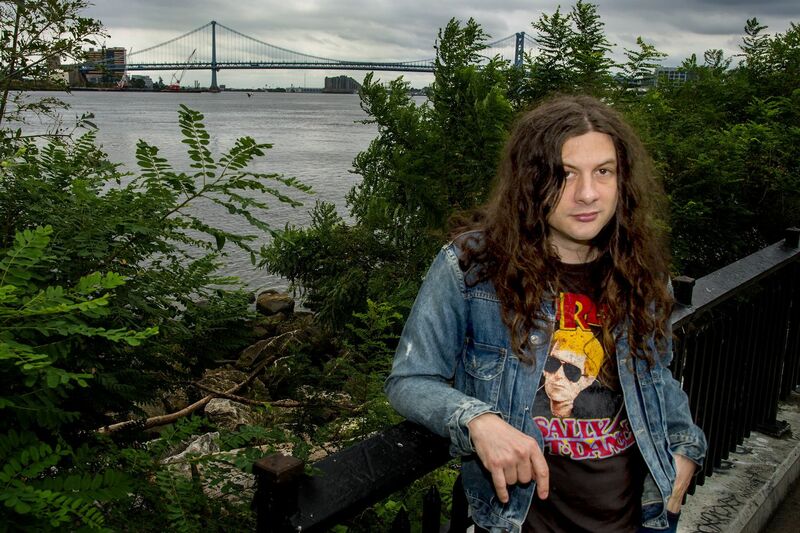 Had the pleasure of chatting with @kurtvile yesterday afternoon in beautiful Penn Treaty Park. It was not a ‘Bassackwards’ interview. His new album ‘Bottle It In’ comes out Oct. 12 on @matadorrecords. Story coming in the Philadelphia Inquirer and on @phillydotcom sometime before then. Best to read it every day. "That song is the closest thing I've had to a hit," he adds. "I can't say that there's a song like that on this record. But one day I will have another smash hit." Urban's stream-of-consciousness comment captures the way Vile writes, which is to plop himself on the couch with a guitar and let a rhythm take him away, resisting the urge to second-guess. "If it's in a moment of inspiration, the rule is not to fuss," he says. "Bassackwards" and several other Bottle It In songs came to him in Ocean City, N.J., where the Viles sometimes summer. "'I was on the beach, but I was thinking about the bay,'" he sings. "Once you've got that rhyme, it comes pretty quick. It's not rocket science, either. I've been writing songs a long time." "Bassackwards," whose title phrase is punctuated by a loop of a guitar played in reverse, hits Vile's sweet spot, amiably pondering philosophical questions over a hypnotic groove, cracking jokes along the way. "That comes from being introspective by nature," Vile says. "Wanting to be funny, but also being a little melancholy or sad. The world is all of those things combined. I definitely go in and out of those spaces in my head. So when I pick up a guitar, varying levels of stress and release are exorcised in a song. I like to combine it all in the music."